If I can say so without being patronising, I think the revelation of this Conference for me has been the quality of the new generation of leadership emerging in the African Churches. They are sophisticated, clear and powerful – clearly have leadership to offer to the whole Communion. Which brings me back to the session last night on Models for Evangelism from Brian McLaren – polished communication and thought-provoking too. It seemed to me compelling to suggest that some at least of the success of the church in Africa is to do with the move from pre-modern to modern society. He suggested that people cannot bring their old religion with them – Christianity suits modern society exceptionally well. But it can’t cope so easily with the move from modern to post-modern society. I’ve also been looking at diocesan links and have signed up for some kind of Communion-wide dating agency. Listening to people describing long term and successful links, it seemed to me that the challenge is to get beyond ecclesiastical tourism. The best have been exploring shared training and evangelism and approach it all in a very strategic and intentional way. I have promised not to come back with a link fixed up – rather to try at best to gather up a number of possibilities which we might subsequently explore. Yes – the bishop-to-bishop chemistry does matter. But these are diocesan links above all. 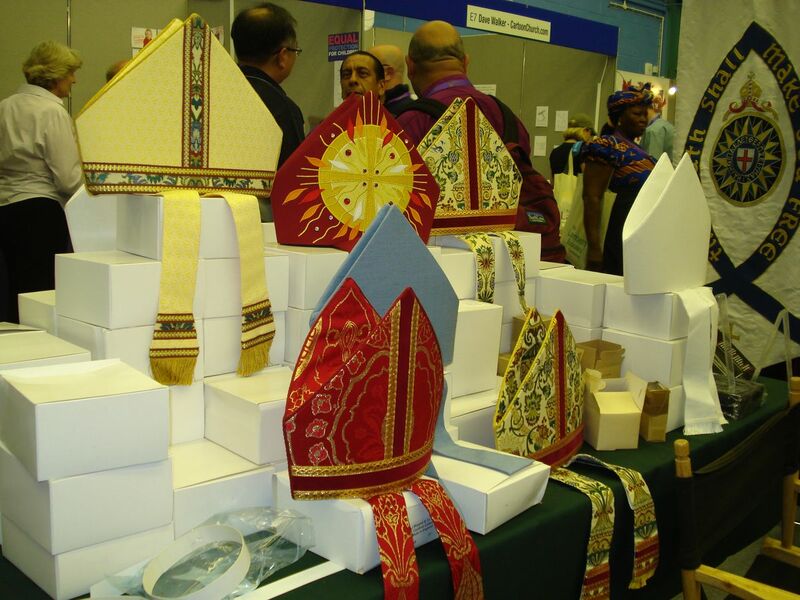 This entry was posted in Blog Entry and tagged 'Lambeth Conference', Indaba, Malawi. Bookmark the permalink. 7 Responses to Good Sermon Vicar! Oh hello. McLaren’s a funny one – I read his `A Generous Orthodoxy’ last year. Not sure that it’s wholly for me, but its approach of reviewing what’s good in many denominations and moving forwards (leading towards the Emergent movement) with a post-modern society is understandable. Great to read your thoughtful reflections on Lambeth. Good to have a flavour of the conference that is not motivated by cheap headline-seeking! Thanks so much for your reflections on the daily activity at Lambeth. It is so refreshing to hear a voice from among the participants rather than from someone trying to sell a paper. It must be a struggle to spend the day in session then blog, but keep up the good work. Tim – you amaze me. Interesting picture of the display of miters. It really caught me eye and started me to think about vestments as icons (in the Iconography sense not the computer desktop or pop culture senses). The two that most got my attention where the solid white one off to the side and the upper red one in between the other two, the one with the cross in the circle surrounded by tongues of fire. The former makes me think of purity and baptism and new life and all that, while the later makes me think of Pentecost and the Spirit and even the Eucharist. The others are just well “silent” to me (and two look as if they just might be identical). The Lambeth Conference sounds exactly like my parish, a group of clever well-meaning people with great integrity who can’t agree on basics, practical or spiritual. But when He and I get together, privately, He always seems to say “Overlook all human failings, just carry on loving”. All will be well and all manner of things will be well.